The American and global economies are being transformed by technological innovation, big data and artificial intelligence. Meanwhile, our nation’s education system is still rooted in and operating on a platform built in the 19th century for a farm to factory (industrial) economic transformation. Like government, the American education system needs to be modernized to meet the challenges of our new economy and more charter schools and vouchers alone will not be enough. Neither will common core or more standardized testing get the job done. 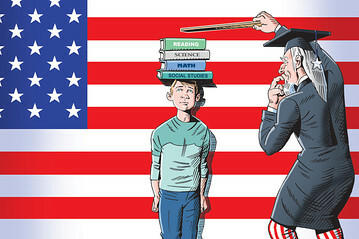 Our nation’s education system from kindergarten through college needs to be restructured and rebuilt based on brain science research, early childhood education research, the organizational structure and needs and demands of the 21st Century innovative workplace; teamwork and collaboration and the growing use of artificial intelligence predictive analytics in classrooms. Existing brain science and early childhood research indicates the earlier we can get children reading and doing math at grade level, the more likely they will stay in school and graduate from high school on time and college or workforce ready. I f this research is correct then education funding should be reoriented to provide universal access to all day Pre-K nationally and greater investments in reading and math teaching and innovation in grades K-3. Instead of vouchers, the U.S. Department of Education should invest in incentivizing the states to establish more Dual Credit Early College High Schools as well as the Middle School Pre-Dual Credit Prep academic programs in partnership with community colleges. The Department of Education should also set as a national goal: the elimination of the need for remedial/developmental education courses at institutions of higher education by 2030. By 2030, if not sooner, every high school graduate in America, regardless of race, gender or region, should graduate college and workforce ready. This should be a minimum standard for our nation’s K-12 education system whether public, private, parochial or charter. Every year going forward, all colleges should report to high schools how many of their graduates tested into developmental education courses and in which subjects. This information should also be reported to state education agencies as well as to the U.S. Department of Education. Combining this data with students’ state standardized test scores as well as SAT and ACT data could help education stakeholders, decision makers and legislators better target enhancement resources to achieve the 2030 National Goal. The Department of Education must also be an active participant in achieving President Trump’s commitment to revitalizing inner city communities across America. The Department of Housing and Urban Development (HUD) alone cannot get the job done. Urban America’s inner city neighborhoods need more than just affordable housing. They need strong, safe and effective neighborhood schools with effective, quality academic programs and qualified, well-trained, innovative and dedicated teachers and principals who are properly compensated. These neighborhoods also need modern infrastructure, better streets and sidewalks, grocery stores that sell quality fresh fruits and vegetables and healthy food at reasonable prices, restaurants and other businesses that help create well paying jobs without environmental justice, pollution and flooding issues. The Department of Education can help lead the effort to revitalize inner city neighborhoods through supporting the community in school model and incentivizing replication of the Harlem School Zone Model with public schools at the center of this expansion. Now is the time for innovative thinking in education that moves beyond the old traditional divides and embraces the need for updating the American education system beyond the existing farm to factory model. Author: Robinson and Adams are professors at the Barbara Jordan-Mickey Leland School of Public Affairs at Texas Southern University. I sent a copy of my book The Magic Pencil to Ms. Devos. I received a thank yo letter from her staff person. I suggested it be reviewed to help her understand what our youth may need in order to succeed.